The New York City Department of Parks established the Schiff playground in 1956. The Board of Education also built an elementary school, P.S 192, on the property, along the western edge of the large play space. In the 1950s, this grand new playground stood out, literally and figuratively in a neighborhood with few playgrounds or athletic fields, and it continues to do so today. The large playground, 3.825 acres, is set into a sharp slope, a condition that creates a shift of levels and a separation between the field and the streetscape. It has a visible presence as a big plateau placed in a densely built area.Packed with kids (and adults) on summer evenings and weekends, the Schiff playground contains an artificial turf playing field. 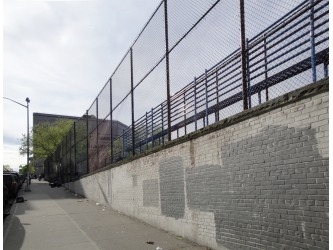 Kids also use a playground, a basketball and handball courts located south of the field at West 136th street, and a small public park on Amsterdam Avenue. The many different groups, who come at different times and for diverse purposes, are an example of the mosaic of New York. Latinos predominate because demographically, the neighborhood is largely populated by immigrants from Latin America. P.S 192 students use the playground mostly during weekdays in the morning and afternoon for recess time and gym classes. 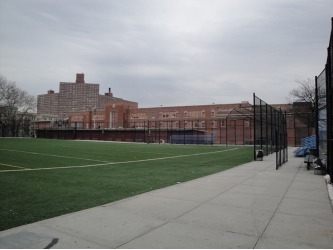 The field is also used by neighborhood children, teenagers and adults usually after school hours and on weekends for soccer, basketball, and handball games. In addition, various soccer teams from Hamilton Heights and the Upper West Side conduct games and practices at the field. The playground has a symbolic value. It commemorates Jacob H. Schiff (1847-1920) -- a Jewish philanthropist who invested in many charitable causes as well as supported numerous educational facilities. He contributed to the care of poor and sick in the late nineteenth and early twentieth centuries. Since it was established, the Schiff playground has been transformed. In 1987, when officially named Jacob H. Schiff Playground, it underwent a $918,623 renovation. In 1998 sidewalks and pavement were repaired, and in 1999, play equipment, and landscaping were added. 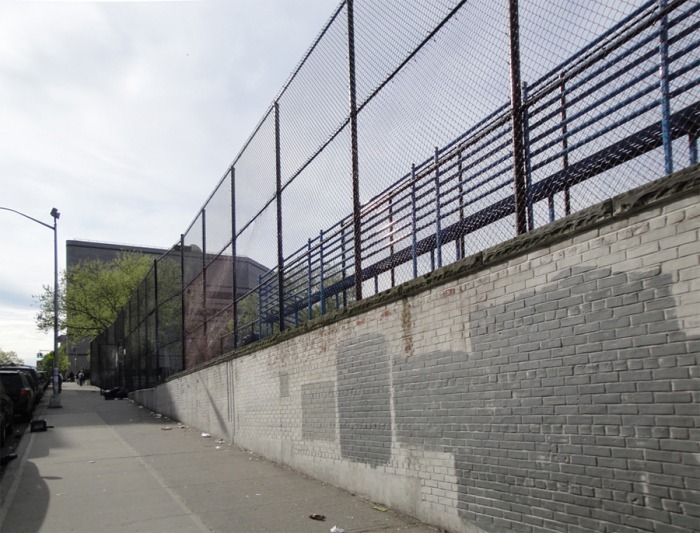 In 2000, a major reconstruction $650,000 took place, including of the P.S 192 playground, with the addition of new benches, play equipment, safety surfacing, benches and spray shower. In 2004 the playground received its current appearance -- an artificial turf field, new bleachers and a drinking fountain. 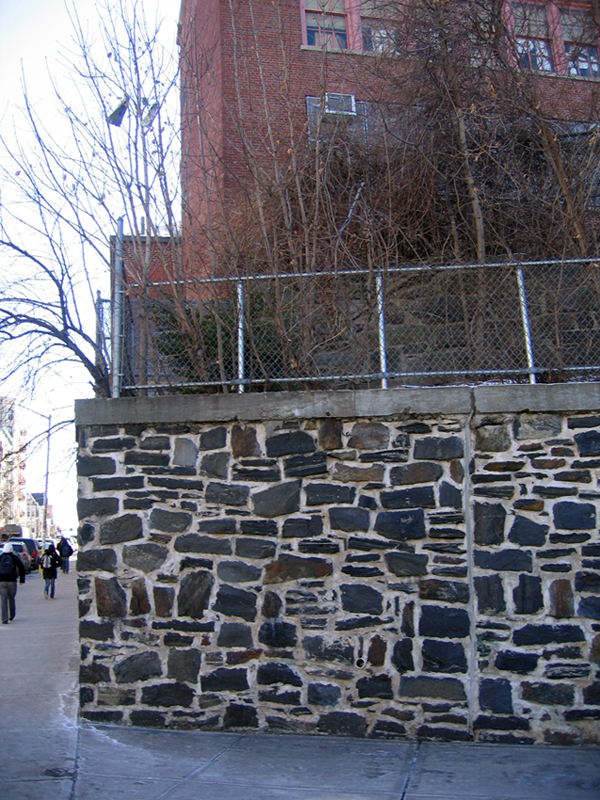 Sadly, little remains of the first building erected on the site, the Hebrew Orphan Asylum of New York. Established in 1860 by the Hebrew Benevolent Society, the charity decided to build a new orphanage uptown in 1884 at Amsterdam Avenue between West 136th and West 138th streets. The large institution, decorated in a modern Renaissance style was designed by William H. Hume. After it was closed in 1941, The City College of New York rented the building. During World War II, the College used the former orphanage to provide housing to members of the U.S Armed Forces appointed to the Army Specialized Training Program. From 1946 to 1952, "Army Hall" was used as a dormitory, library, and classrooms. The building was demolished in 1955. 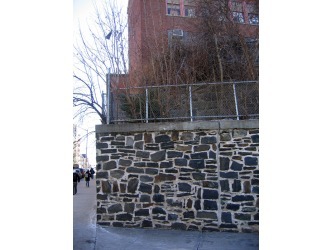 The only trace of the Hebrew Orphan Asylum is a fragment of its retaining walls; it can be spotted on the west side of P.S. 192, on the edges of the block. 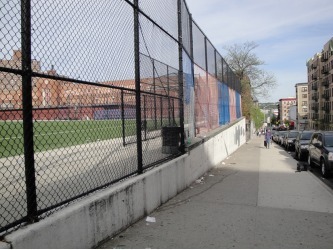 The Schiff Playground has great significance within the Hamilton Heights neighborhood. This place possesses a physical, historic and symbolic importance for children having served and been used by them since 1884. I see it as a puzzle piece of the city's history, one that conveys the dynamic essence of New York, which is one of constant change. The Hebrew Orphan Asylum was an important element in the neighborhood. Its traces can be found in old photographs, memoirs and books. The playground, built on the orphanage site, underwent numerous transformations that had an impact on the built environment as well as the activities taking place on the site. The activities changed according to the adjustments made to the playground and vise versa, the needs of users prompted the change and the constant transformation. Today, the Schiff playground continues to reflect the special fabric of New York City. Passing by the playground on a daily basis I observe, at different times of day and week, the various ways in which this playground is occupied and used. The numerous groups that occupy the field include children of different ages (mostly neighborhood children and P.S 192 students), teenagers as well as adults of diverse backgrounds and origins. They engage in various activities such as soccer, baseball and other ball games, gym classes as well as less official ones such as socializing by the bleachers mostly by teenagers. Each group appropriates the field according to its special activities and needs. In the way, people transform the space and assign it a new character and use -- soccer field, baseball field, gym class space, and hangout space. This situation emphasizes the field's flexibility and the social sustainability of the Schiff playground -- a place that remediates the lack of recreational outdoor spaces in the Hamilton Heights.